You want a chamois produced with top quality materials but you don’t have particular knowledge on the matter? In this post we will guide you in discovering our foams and our fabrics, whose value has made the Elastic Interface® brand synonymous of guarantee in the field of protective paddings for cyclists. A quality foam (or padding) should resist wear and tear and guarantee an adequate softness to the chamois. It is thanks to this last characteristic that improved elasticity and flexibility are achieved, giving the cyclist greater freedom of movement. What are the characteristics of a good padding and how important is its level of density? In order for the foam to provide protection from bumps and vibrations, it should have a good level of breathability (less perspiration), sufficient softness (better anatomic adaptability), an appropriate density and lift (greater cushioning power) and an excellent elastic memory (less wear and tear). The lifting properties concern the foam’s resistance to compression, while the elastic memory is the capacity of a material to return to its initial shape after compression. We use padding with variable density included between 40 kg/m³ and 200 kg/m³ (Hybrid Cell System) and show you how to a greater density corresponds a better lift. Our fabrics have been developed through advanced scientific research, thus reaching a high technological level. Their principal characteristics, exclusively typical of the leading products on the market, are: softness, elasticity, breathability and resistance of colours when subjected to washing and transpiration. In this manner, rubbing on the skin and reddening caused by overheating is greatly reduced, the pedalling movement is perfectly supported and the possibility of skin irritations and allergies is eliminated. Furthermore, they have bacteriostatic properties, thanks to which the normal bacterial flora of the cyclist’s skin prevents the spreading of harmful bacteria. If you wish to find out more about the quality of each fabric, produced in collaboration with MITI Spa, please read our specific page. 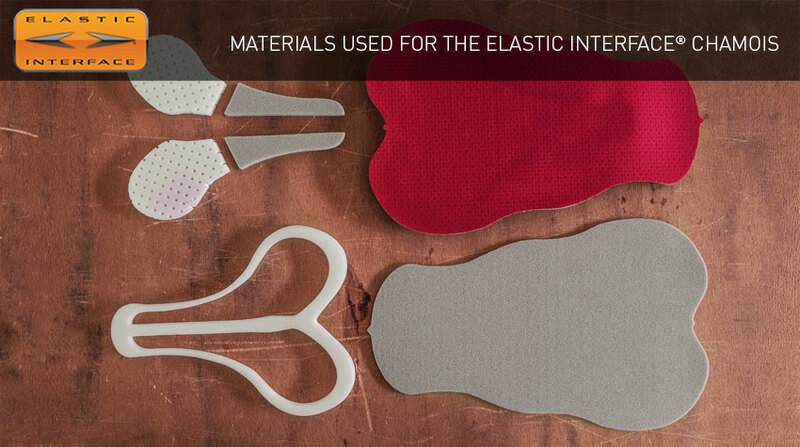 Before you purchase a cycling pad, get proper information on the composition of its materials and, if you want to be safe rather than sorry, make sure it has the Elastic Interface® logo.